You can see this singer/songwriter in Brighton this weekend! An album that ranges from trad. Blues into psychedelic blues! 9/ Carolina Ramblers String band – That lonesome valley. 1932. A great stringband from the distant past! Could have picked any song from this tremendous album! In the process of reviewing it! McGuinn was rarely this good! Self indulgent on my part? YES. Brilliant? YES!! A little psychedelic country rock?! Simply the greatest rock song ever, although this less than four minute version is just an appetiser for the nearly ten minutes original! I promised the listeners on Mondays ‘Seaside country’ that I would play this original version by the master rather than his less than definitive 1960s version. It’s Christmas, but don’t worry, it’ll soon be over! 7/ Jerry Merritt – Another day on route 66. 1958? Still can’t believe this great track is so old! Always space for these Brighton hillbillies! Late great guitarist with a great band! Great song by a great band from a great album! Helps to keep fresh the pain of huge injustice, although probably more as frustration than pain at the fact that nothing has really changed. Beautiful Christmas song by old golden tonsils!!!!! Not sure why I played this. Nice voice though! The song and the album that brought him to my attention! Not earth shattering but a pretty good alt. Country band. My tribute to the tribute album! 11/ American Aquarium - Meredith from the 2010 album 'Small town hymns'. One of the albums of the year? An excellent piece of banjo playing on this obscurity! Very promising debut. If you like people such as Old Man Luedecke you may well like this! A great, almost forgotten band! Another high quality singer songwriter and what an amazing album title! A perfect show closer for the formwe Bandsman! Bruce Springsteen – 4/ Because the night 12/ Fire,from the 2010 album 'The Promise' (unreleased recordings from the 'Darkness …..' sessions in 1978)Typical mainstream! Overhyped but apart from half a dozen songs very little of worth! Terrific album that is basically a throwback to the days before Nashville coated everything in gloss! Great track from a great album by a great band! A classic song from a classic album that helped to propel alt. Country! He's playing in Brighton in 3 weeks and this album is growing on me! One of the most gorgeous ballads ever! Never more than a cult blues figure, but what a talent! Great track from a …..........................! A consistently high performing roots artist for forty years! An aging American punk/roots band that have still got it! Excellent quirky Texan singer songwriter! 'Swamp rock' from a band that never went near a swamp! Modern 'hokum' by an Aussie! Pension supplied by Eric Clapton! One of the few modern 'old time' bands I never tire of listening to! Were it not for Charlie, would have been album of the week! The playing of this was inspired by an acoustic version in a Brighton pub on Monday night! 9/ The Railbenders – The outlaw way from the 2005 album 'Showdown'. I remember seeing him do this live. Quite chilling! Mourning the passing of summer! Always room for Andy P. Bormes! Jay Farrars vocals! Enough said! 21/ Screen Door Porch - Morning sun from the 2010 album 'Screen Door Porch'. 24/ The Mayhaws – Lonely places from the 2009 Independant album ' Lonely places'. A really good mellow instrumental to finish! A forgotten track by an all time great! Always room for the Dead! The only version I’d ever play! A great song written by another Flatlander! It is what it says in the title. The greatest guitar American Roots song ever, although preferably the long version. The best and the worst of ‘Country rock’ in one song! Always room for these Brighton Hillbillies! An old-time/blues match made in heavan! Brings back some long forgotten memories! A tremendous update of the above, and what a contrast! Always room for this great bunch of hillbilly/blues merchants! 8/ Widewater – Fighting fire with fire. 9/ Cannons Jug Stompers – Minglewood blues from ‘Harry Smiths Anthology of American Folk Music’. Excellent demo song from this Brighton roots band and soon releasing an album! 14/ Carolyn Mark & N.Q. Arbuckle - Downtime from the 2009 Mint records album 'Let's just stay here'. A hell of a lot going on in this gorgeous song! 15/ Johnny and the Hurricanes – Reveille rock. 1960. Just to finish off. A classic instrumental! Always room for a song by the greatest ever singer/songwriter and Father of country rock! The only original member of the ‘Band’ still making music that’s worth a damn! I know I played one by him last week! Give the album a listen to find out why! 11/ Butch Hancock - Road map for the blues from the 2006 album 'War and Peace'. Always room for this bunch of Brighton Hillbillies!! An excellent countryish blues song by the talented Scotsman! 5/ Dave Alvin - Blackjack David from the 1998 album ‘Blackjack David’. 11/ Mark Olson - Morning dove from the 2010 album 'Many colored kite'. 2/ Steppenwolf – Born to be wild from their 1968 album ‘Steppenwolf’ & the soundtrack to ‘Easy Rider’. Just received a 43 track version of this album so stuck a pin in the track list! Two tracks by J.P are better than one! Excellent song from a great album by a great ‘modern old-time’ musician! 5/ Frank Fairfield – Nine Pound hammer from the 2010 album ‘Frank Fairfield’. An authentic sounding throwback to the 1920s. Probably should have been my album of the week and is playing in Brighton on Saturday 4th Sept. Decent album by highly rated London alt. country band. The greatest of Chicago’s blues songwriters & not a bad singer! 8/ The Koan Brothers – Devils well blues from a 2009 demo. Very early recording of the oft recorded old English song but none as eerie as this. Excellent instrumental by a highly original band. Harold Eugene Clark 1944 - 1991. A huge and largely unrecognised talent who influenced many of the country rockers and alt. country musicians who followed. Nothing I can say that hasn't already been said dozens of times before! Chester Arthur Burnett 1910-1976. One of the all time greats of the blues! 7/ 17 Pygmies – Blackwater, Tn. From the 2009 album ‘The outlaw J.D. Ray’ An under recorded but excellent folksy Americana band that have also used eastern influences. They deserve to succeed for their name alone! Edward James House jr. 1902-1988. Not just one of the all time greats, but, for me at least, THE all time great! 9/ Lonnie Donegan Skiffle Group – Lost John. (trad) Rec 1956. Anthony James Donegan 1931-2002. Another great, but underappreciated roots artist, who sadly, is more remembered for his commercial late 50s novelty songs than for his great skiffle/blues achievments. Ranges from beautiful instrumentals to almost manic hillbilly! Helped to define Chicago blues! Incredibly consistent for over 30 years! 6/ Hey Negrita – One Mississippi from the 2005 album ‘We are catfish’. If ‘Skynyrd goes country’ has appeal give this band/album a listen! 1/ Creedence Clearwater Revival – Proud Mary from the 1969 album ‘Bayou Country’. Great band, excellent album, classic single! 2/ Rolling Stones – Honky tonk woman. Well sung and played by a great actor! Dock Boggs 1898-1971 Miner, moonshiner, musician. One very short step from primeval! Perhaps the first popular American musician to’ live fast and die young’. 8/ Sadies – Another year again from the 2010 album ‘Darker circles’. Good song from an excellent album by a great live band! Playing at Ropetackle centre this Saturday 7th August and at the Prince Albert, Brighton on Sunday 8th. 11/ Stairwell Sisters – Kentucky winder from the 2008 Yodel-ay-hee album 'Get off your money'. Traditional fiddle tune by a brilliant modern old time band. 6/ Uncle Tupelo – No depression from the 1990 album 'No depression'. 7/ Chris barber Skiffle Group with Dickie Bishop – Gypsy Davey (1956) from Pig iron, washboards, freight trains & kazoos. (2008 album) Trad.arr. Bishop. 11/ Steppin In It – Washentaw county from the 2008 album 'Simple songs for troubled times'. Jacob Jones – 1/ The blues ain't got nothing on you. 2/ Lost on the Ohio, both from his 2010 album 'Bound for glory'. Not much that can be said! Some all time great rock guitar playing! A counterpoint to the previous track. Beautiful 'old-time' singer/songwriter who is playing in Brighton this Saturday 24th July. A classic track from a genuinely classic album! So different to the previous track it could be a different song. Lonnie Donegan Skiffle Group – Rock Island Line from the 4 c.d box set by various artists 'Pig irons, washboards, freight trains & kazoos'. The most comprehensive Skiffle compilation I've ever seen. Skip James – Hard time killing floor blues from the 2003 album ' Hard time killing floor blues'. A mid 1960s recording of his 1931 song. 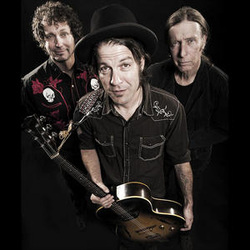 Mat D & the Profane Saints – Heart of diesel from the 2007 album 'Gasoline rattle'. A terrific album that is at times entertainingly morose! Mojo - Tom Petty & the Heartbreakers. 2010. Proof that even Emmylou can be bland!!! The only reason for playing this was because I like it! Without any doubt the definitive version of this great song. I still remember their amazing live performance of it at 'Maverick festival' 2 years ago. I know I played 2 tracks from this album last week, but I told the captive audience about her great Brighton gig on the 8th & illustrated some of her talent by playing this! The next 2 tracks were played because of a small piece that I read in a national paper about Trevor Peacock (remember Jim Trott, no, no, no, no, no, ........ Yes, from the Vicar of Dibley!) He is not only a talented comedy actor, but also a songwriter (wrote hits for Joe Brown & Hermans Hermits amongst others) & a scriptwriter, which brings me to the point! He wrote the scripts for the '6 '05 Special. Remember the late 50's pop show? I have a fair amount of Skiffle in my collection so thought it would be good to play the title song plus a great old rock & roll song that I can still remember hearing on the programme! Lightnin' Hopkins - Katie Mae Blues. 1945. John Henrys - Patriot song, from the 2010 album 'White linen'. The last 2 tracks were played simply because they are from 2 really good new albums. Molinari is from the Thames delta but could easily be from the Mississippi delta! Album of the week:- Sara Petite - Doghouse Rose. Rel. 2010. Tracks played - 1/ Doghouse Rose 2/ Bootleggers. 4/ Carl Perkins - Honey don't. 1955. Taken from 'Original Sun greatest hits'. 6/ Everly Brothers - T for Texas taken from the 1969 album 'Roots'. (Many think this is a classic country/rock album, I don't. I think it's a self indulgent psychedelic/ country experimental album that doesn't even come close to working)No prizes for guessing which version I prefer! 11/ Michael Nesmith - Silver moon from the 1970 album 'Loose Salute'. Album of the week:- Old Californio, 3 tracks from their new 2010 album 'Westering again'. The tracks are; 1/ Just like Joseph Campbell 2/ Mouths of babes 3/ Warmth of the sun. Hatful of Rain - Wanderlust from the 2010 e.p. Son House - Walking blues. 8/ Pokey LaFarge - Josephine from the 2006 album 'Marmalade'. This weeks programme ran for 2 hours 7-00 - 9-00 p.m. hence the extra long list & 2 albums of the week! Next weeks will also be a 2 hour prog. Yarn - Alone on the weekend, Down on your luck & These bars don't look too friendly from the 2010 album 'Come on in'. 8/ Stairwell Sisters – Get off your money, from the 2008 Yodel-ay-hee album 'Get off your money'. 9/ Dark Hollow Bottling Company - Strong man, from the 2010 album 'Gone, gone, gone'. 10/Great American Taxi - New Madrid, from the 2010 album 'Reckless habits'. 14/ Caleb Caudle & the Bayonets - Weightless, from the 2010 album 'Snake River canyon'. Jayhawks – A break in the clouds from the 2000 Columbia album 'Smile'. New Riders of the Purple Sage – Gypsy cowboy from the 1972 Columbia album 'Gypsy cowboy'. Hellbound Glory – Be my crutch from the 2010 album 'Old highs & new lows'. Whiskeytown - Houses on the hill from the 1997 album 'Strangers Almanac'. Watermelon Slim - Please take this cup from the 2010 album 'Ringers'. Wovenhand - Singing grass from the 2010 album 'The threshing floor'. Stairwell Sisters – Kentucky winder from the 2008 Yodel-ay-hee album 'Get off your money'. 6/ Widewater - Run Greyhound run from the 2009 e.p. 8/ American Aquarium - Hurricane from the 2010 Last Chance Records album 'Small town hymns'.